We may live in a digital world but you are still going to need to put your signature on important documents. You can always do this by printing your documents, signing them, and scanning them. Perhaps the better is to use apps such as SignMyPad for iPad. 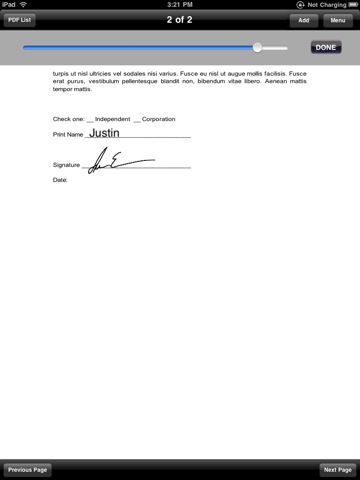 SignMyPad lets you sign your PDF documents and annotate them. SignMyPad for iPad makes you more productive on the road. You can sign and date your documents and send them back out quickly. It can hold multiple signatures which is nice. This app supports check-boxes and radio-boxes for your documents too. SignMyPad for iPad could be a bit more polished. It does have a clean interface and is fairly easy to use. More ink tools and customization features would be nice.